For the song by Fu Manchu, see King of the Road (album). 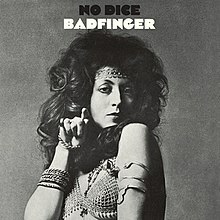 No Dice is an album by British rock band Badfinger, issued by Apple Records and released on 9 November 1970. Their second album under the Badfinger name and third album overall, No Dice significantly expanded the British group's popularity, especially abroad. The album included both the hit single "No Matter What" and the song "Without You", which would become one of the most successful compositions of the rock era. Although this was the band's second album released under the Badfinger name, the previous album, Magic Christian Music, was originally recorded as The Iveys but released as Badfinger. It was the band's first album recorded after new guitarist Joey Molland joined the group, replacing bassist Ron Griffiths, but Molland's addition caused Tom Evans to switch from rhythm guitar to bass. Badfinger would release five albums, generally their most successful recordings, with this line-up. No Dice peaked at number 28 on the Billboard Hot 200 chart. Widely praised in music reviews at the time, Rolling Stone magazine opined that it represented what the Beatles would have sounded like had they retained their initial formula. The single from this LP, "No Matter What", peaked in the United States at number 8 on the Billboard Hot 100 chart in 1970. The song is often regarded[by whom?] as an early offering in the power pop genre. Other stand-out tracks[according to whom?] are "Better Days", "I Don't Mind", and the closer, "We're for the Dark". The album also contains the original version of "Without You". Although Badfinger did not release the song as a single in Europe or North America, it was taken to number 1 on the Billboard charts in 1972 by Harry Nilsson, and became a hit for Mariah Carey in 1994. "Without You" has been the top money-earner for Badfinger in publishing royalties, having been covered by over 180 artists. The song was also picked to provide the title for Dan Matovina's 1997 biography Without You: The Tragic Story Of Badfinger. No Dice is a slang term meaning "not possible". It was the first of three albums titled by bassist Tom Evans. The term was originally used in dice games: when a throw is out of play or not lying flat, the throw is not valid and is ruled as "no dice". In October 1991, No Dice was digitally remastered at Abbey Road Studio by Ron Furmanek. The remastered album was released in 1992 by Capitol Records and Apple, with five previously unreleased bonus tracks. Of the bonus tracks, "Friends Are Hard to Find" was an outtake from the same Mal Evans-produced session that saw the recording of "No Matter What" and "Believe Me". "Get Down" was originally attempted with Evans but the version here was recorded with Geoff Emerick. The three remaining tracks, "Mean, Mean Jemima", "Loving You" and "I'll Be the One", were recorded with Emerick between January and March 1971 (after the completion of No Dice) for the intended follow-up album that was never released. Pete Ham – lead and backing vocals, lead and rhythm guitars, piano, tack piano on "Midnight Caller", Fender Rhodes electric piano on "Without You"
Mike Gibbins – drums, backing vocals on "It Had To Be", lead vocals on "Loving You"
^ Christgau, Robert (1981). "Consumer Guide '70s: B". Christgau's Record Guide: Rock Albums of the Seventies. Ticknor & Fields. ISBN 089919026X. Retrieved February 21, 2019. ^ Larkin, Colin (2006). The Encyclopedia of Popular Music (4th edn), Volume 1. New York, NY: Oxford University Press. p. 358. ISBN 0-19-531373-9. ^ a b "Badfinger No Dice". Acclaimed Music. Retrieved 15 November 2014. ^ Harris, John (November 2010). "Strange Fruit: Various, Original Apple albums, 1969–73". Mojo. p. 116. ^ "Badfinger – No Dice CD Album" > "Product Description". CD Universe/Muze. Retrieved 26 August 2014. ^ "Badfinger – No Dice". SuperSeventies.com. Super Seventies RockSite. Retrieved 28 December 2016. ^ No Dice (CD). Badfinger. Capitol Records/Apple Records. 1992. CDP 7 98698 2. "Love Is Gonna Come at Last"
"Meanwhile Back at the Ranch"/"Should I Smoke"
This page was last edited on 14 April 2019, at 12:13 (UTC).